Agapanthus Plants and Miniature Agapanthus are a favorite plant with landscapers and new cultivars are now available for sale. A strap leafed plant used widely as border plants and in massed plantings. You can even buy Dwarf cultivars great for those looking for a lower growing plant. Agapanthus as great for lazy gardeners, they can become a weed if allowed to seed. They do not run so its only deadheading to prevent problems. They do have a tendency to self seed more vigorously in some areas than others. The sterile cultivars are the ones to look for. They look great when used to line a driveway or path and lower growing cultivars can be used as a garden border. Look for cultivars such as Black Panther Agapanthus ‘Queen Mum’ and Silver Baby. 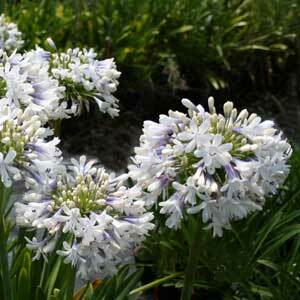 Agapanthus ‘Guilfoyle’ is a particularly dark flowering cultivar while ‘Snowball’ is a white flowering dwarf variety. Bulbs and Plants are readily available for sale online and are a drought tolerant and virtually disease free plant. All species are tough, sun loving plants and come in a variety of colours from white to blue, mauve, purple and pink. Look for new bicolour varieties with blue and white flowers. As these are a plant that are easily transported and can be purchased online these are a tough plant and require very little fertilizer in most situations. Agapanthus make a wonderful border and the dwarf varieties such as ‘ snowball’ are excellent for rockeries and containers. These tough plants can be grown in coastal areas and are also frost tolerant. Deadhead dry flowers before they seed by snapping them off at the base of the stem. Grow non- seeding or sterile varieties near areas of sensitive natural vegetation. Flower colours varies from the traditional blue through to white however multi coloured forms are now coming onto the market. Although growing well in shade, however they tend not to flower so well, a sunny position is best in a well drained soil. Try for a minimum of 6-7 hours sun a day for best flowering results. Little care is needed, deadhead after flowering and a slow release fertiliser when planting is about all that they need. Reasonably drought tolerant once established, however some water during dry periods will be beneficial. Many species are easy to propagate from seed, in fact they will ‘self seed’ easily so they can become a little weedy if not deadheaded. New sterile cultivars (as well as older varieties) can also be grown by division and tissue culture. Easily propagated from seed or by division agapanthus are often hybrids, so although you can grow them from seed, unless you are growing a species they may well not come true. It also needs to be remembered that some cultivars are sterile so although they may set seed they will not germinate. Germinating agapanthus seeds is not at all difficult, especially fresh seed. Seed can be sown into a seed raising mix in a tray or pot and lightly covered. As even agapanthus seedlings develop strong root systems sow them into reasonably deep trays. You newly propagated seedlings do not like to be moved so wait until the seedlings are around 15cm (6″) tall before potting up. Keep new seedlings moist but not wet using a liquid seaweed fertiliser. The second propagation method is by division, this can be carried out in early spring or late summer, simply dig the clump, divide with a spade or knife and replant, as long as you have a root system agapanthus are easy to propagate by this method.